Scenario: Conan wokes up ans can't still believes that he's an child. It has been three days that he is still an infant, which that he later is still thinking to lay a finger on the mysterious person who gives him that strange poison. While that he opens the door he sees Kogoro sleeping wich he later wakes up and were watching to the pop idol Yoko Okino. Conan goes off to school where he meets Ayumi Yoshida, Genta Kojima and Mitsuhiko Tsuburaya. They want to be friends with him, which that Conan don't want too and head off to Professor Agasa's house. While then on Professor Agasa's house, Professor Agasa were telling to Conan that Ran were been visiting Professor Agasa cause she were been worried about Shinichi, so Agasa were been telling that Shinichi went on a verry difficult case, wich that Conan looked worried what he's now doing to Ran, later then Conan gets a gadget from him the Bow Tie Voice Changer, wich allows him to have any voice like he want to. Well later he goes back to the house of Ran, wich that he were looking to Kogoro and wree thinking that it is impossible to make Kogoro a great detective. Ayumi, Genta and Mitsuhiko finds the place were Conan is and evenly sees a car stopped at the place were Conan stays. Ayumi sees then a mysterious woman and a mysterious men, wich that Ayumi knows her directly. Kogoro wakes up bicause Yoko Okino is on TV, wich later a client appeared at the office of Kogoro. 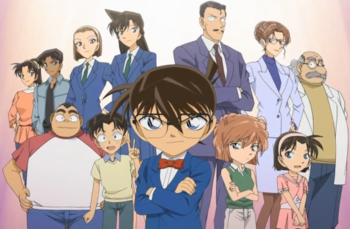 Kogoro has no any time for the client and tells him to her, wich that he later sees that it is Yoko Okino and were starring at the TV wich that Yoko were telling is a tape, wich that Kogoro runs to his room to dress hisself perfect, wich that he appeared verry clean, and evenly Conan thinks stupid about him. 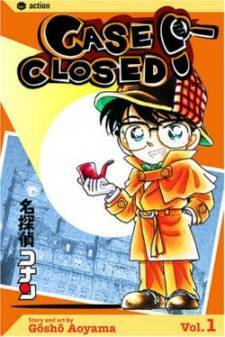 Yoko tells Kogoro later that she were been followed by a mysterious stalker. Kogoro then helps her and must put her autograph on various papers and then goes off to Yoko's appartment.